To be allowed to do that, they will need the Commissioners to grant them a rezone of the property from its current A-1 Agricultural status to B-2 Highway Business. They also need a special use allowance to construct their facility in the B-2 zoning category. The Oconee County planning staff has recommended approval of both requests, and the Planning Commission did the same at its meeting on May 19. Owners LCN Oconee LLC and Frank Halpin also are seeking two hardship variances. The first would allow for construction of a cul-de-sac on Virgil Langford Road without a turn-around, and the second is to allow for the facility on a local street rather than on a business thoroughfare. 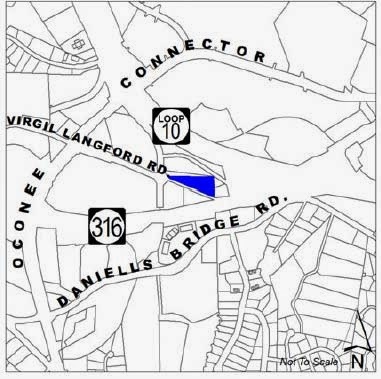 The property has frontage on a stub of Jennings Mill Road, which terminates, but does not intersection SR 316, on one end, and terminates, but does not intersect, the Oconee Connector on the other. Virgil Langford Road technically terminates, but does not intersect, SR 316. And the property touches another road, known as Old Jennings Mill Road, which runs from Jennings Mill Road to SR Loop 10, but does not intersect SR Loop 10. An electric power transmission substation is on the south of the property. A map with all of the street names is here. The developers are proposing a self-storage facility to serve both personal and business needs. The three-story, 152,250-square-foot building or buildings will provide climate controlled storage space that will be accessed internally. The project will be completed in three phases, with total buildout expected for 2018. The facility will be served by county water. Sewage will be handled by a septic system. The Board of Commissioners meeting starts at 7 p.m. in the courthouse in Watkinsville. The meeting also includes a second public hearing on the proposed Fiscal Year 2015 budget.